"Ben Wallis recognized our dilemma and addressed our issues immediately. He was thorough in his explanations and offered solutions..."
"From start to finish the process was a pleasure"
"Your sales person Ben is very patient and professional even though it was a small job comparatively. Thanks to the crew in doing..."
"We were so impressed we referred my father and he did business with you as well. Your installation crew was very clean and..."
"I am secure in knowing that Clarke Basement Systems stands behind their products and workmanship. I am satisfied with their work..."
I am secure in knowing that Clarke Basement Systems stands behind their products and workmanship. I am satisfied with their work. They take interest in any issues that may arise go beyond the call of duty. Thank you. Your men did a great job. They were friendly and polite and took the time to explain what they were going to do. The pool deck looks better than what I expected. They did a great job of cleaning up. It is amazing that they could work and produce such great results in this terrible heat. Ben has extensive experience in all fields of home construction and maintenance and a university-level understanding of hydrogeology, the issues presented by leaking basements naturally drew him to a career in solving these unique challenges. Ben was originally hired as an Installation Specialist to assist with special aspects of construction requiring detailed finish work. Ben was initially sent to the Basement Systems Headquarters in Seymour, Connecticut for formal training which he found to be exceedingly valuable. After a while of working in our Production Department, an opportunity opened up for him to try his hand as a System Design Specialist. Ben jumped at the opportunity, and underwent further training in Atlanta, Georgia with the professional training staff from Basement Systems Inc. of Seymour, Connecticut. Ben most enjoys spending time outdoors with his family. Outside of family, he enjoys working on the many building projects he has undertaken on the large family property. Presently, he’s building a log cabin in the forest beside the pond. Where work is concerned, Ben is always pleased by his ability to bring resolution and ease of mind to customers whose houses were inundated with water, and are now dry and comfortable environments. A home in Cheltenham, Ontario, had a problem located in the cold cellar of the house. Groundwater was seeping in at the floor/wall joint. The homeowner wanted to store items in this room safely without them getting wet and damaged. The customer called Clarke Basement Systems and spoke to Ben Wallis who explained the solutions to their problem. Luke Havercourt and the team were able to complete the work in one day. They installed WaterGuard® sub-floor drainage system and ThermalDry® wall membrane. They were introduced to prevent groundwater from getting to the floor, by collecting any future water or moisture into the newly installed WaterGuard® around the perimeter. The customer is satisfied because they will no longer have groundwater on the floor in the cold cellar, and can safely store personal items with peace of mind. An old home in Stouffville, Ontario had a problem located in the basement. The house was old and leaked in one place over many years. The homeowner was not comfortable selling his home without a reliable sump system to make sure the basement stays dry for the next homeowner. The customer called Clarke Basement Systems and talked to Ben Wallis, who explained a solution to the leaky basement. Mark Dougherty and the team installed a SuperSump® Premier Sump Pump System to collect any water and moisture that enter the basement. The discharge line leads to the outside of the house, and an IceGuard® Discharge Line System was installed on the exterior of the home to ensure the water will leave the house, even if the sump discharge drain pipe freezes solid. The customer was satisfied because he can now sell his home with perfect peace of mind that he has done everything he can to make sure that the next homeowner will have the best equipment available. A home in Aurora had water leaking into the entire perimeter of the basement. It was coming up between the floor and the foundation wall. It was a problem because the house smelled very musty and the customer had health issues. The homeowner called Clarke Basement Systems and spoke to Ben Wallis who was the inspector and told them what our team would do to waterproof the basement. Lucio Flores and the team came in and removed the Wall materials and opened up the concrete floor to install the WaterGuard® Below-Floor Drain System, the ThermalDry® wall membrane and the SuperSump® Premier Sump Pump System. The WaterGuard® prevents water from being able to reach the basement floor elevation, and Thermaldry wall membrane prevents any future moisture or leakage behind the membrane from being able to affect the building materials in any way. The customer was satisfied because their basement no longer smells and they have solved the leaky basement issues permanently. Our customer located in Schomberg, Ontario was concerned about a problem in their basement. Some ports in the foundation had started leaking from a crack that formed in the wall. It had begun to pool on the floor which was a concern for mould growth. The customer was anxious the leak would lead to future damage. Our team went to the home and took a look at the problem area in the basement. They used our FlexiSpan® Wall Crack Repair System which would permanently fix the problem. The sealant fills the spaces in the damaged wall. A thick foam wick placed on the foundation sealed the ports. The homeowner could finally store more items in their basement. A home in Newmarket, Ontario, had water seeping into the finished basement. The water was coming in through the floor and the wall causing the house to smell musty. Mould was starting to form on the drywall and baseboards, and the homeowner wanted to fix this issue before it got any worse. The customer called Clarke Basement Systems, and Ben Wallis explained everything. Luke Haverkort and the team came in and took down all the drywall. They installed ThermalDry® wall membrane on all the walls to keep moisture out and direct any seepage into the newly established WaterGuard® drainage system around the perimeter. This solution allowed the customer a piece of mind knowing their water issues are gone and the musty smell would disappear. Now they can renovate the basement knowing it will stay dry. Left untreated leaking wall cracks can cause damage and mould growth. Water had seeped into this basement through a foundation wall crack affecting our customer's peace of mind. A FlexiSpan® Wall Crack Repair System was installed to fix the water seepage issues permanently. This polyurethane polymer will never dry out or crack as it bends and adapts to the movement of the foundation wall. To ensure a permanent waterproofing solution for a leaking wall crack repair our team installs a secondary drainage system over the crack. This FlexiSpan® system collects water and directs it into a Dry Well located at the base of the foundation. The water is then directed into the sump system and pumped outside protecting your home. This garage was once heavily affected by Frost. The foundation was repaired and protected from future damage, and the structure was straightened. This customer was desperate when an exterior waterproofing company dug around their sunroom resulting in a gap between the walls and flooring. Using our PolyLevel® Injection, the floor is now stabilized and lifted back to its original height; now the sunroom looks better than ever! A home in Pefferlaw, Ontario needed a foundation repair and to permanently stabilize an interior chimney mass that was sinking and pulling the house down. The lift was accomplished and customer was completely satisfied with the result. This homeowner's garage's concrete foundation was very cracked and slanted. 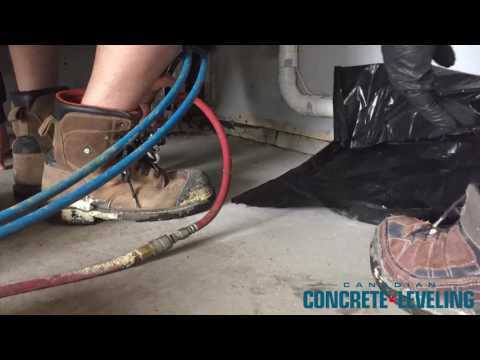 We used our PolyLevel® Injection to lift the concrete slab. It was a tough lift, but our crew proved to be successful in stabilizing and lifting the slab to its original height.